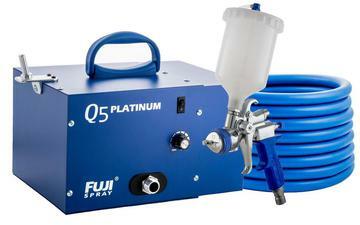 The ultimate system for the professional finisher, the Q Platinum Series delivers: power, speed and versatility, while still being the quietest HVLP spray system on the market. Ideal for all large refinishing projects: furniture, cabinets, walls, automotive, marine and more. The Fuji noise reduction method is patented. Noise is reduced by over 50%, making the Fuji Q-Series the quietest turbine available today. The Q5 Platinum Turbine with its powerful 5-stage motor produces approximately 9.5 psi, allowing for less thinning of viscous materials and achieves finer atomization. The Q5 features many new technological advancements. Incorporated into its design is a proprietary Heat Dissipation Chamber. The HDC expels excess heat from the turbine resulting in much cooler operating temperatures. 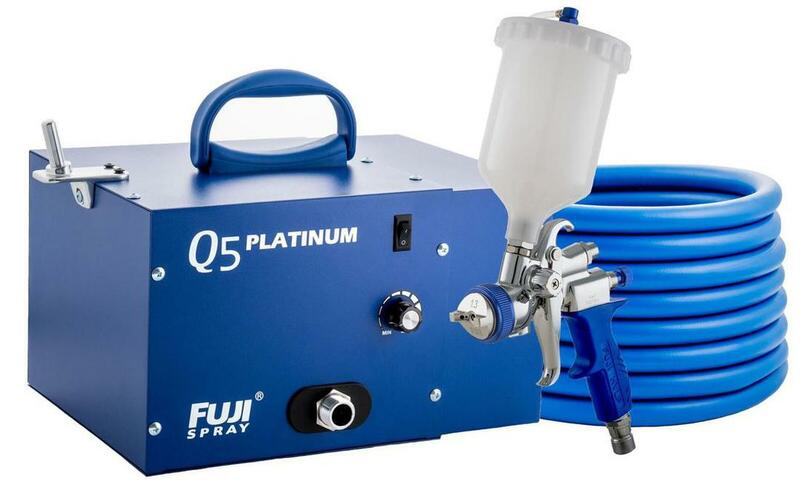 Another key feature unique to the Q5 Platinum system is the variable speed control, that offers you the ability to adjust the psi to the optimum adjustment needed to perfectly atomize your coating. This is achieved while reducing the overspray/bounce-back to an absolute minimum. BONUS - Every Q5 Platinum System includes the 5 for 5 Bonus Kit! Noise reduction technology reduces the sound of the motor by 50%. What's Included: The turbine, choice of Fuji Spray gun (T70, T75G or GXPC) with cup, 25 ft. hose with quick-connect, air control valve, user manual, viscosity cup, wrench, and cleaning brush. PLUS: 5 for 5 Bonus Kit, including a 6’ whip hose, wet film gauge, 19 pc. spray gun cleaning kit, extra turbine filters and “Always Measure” booklet.